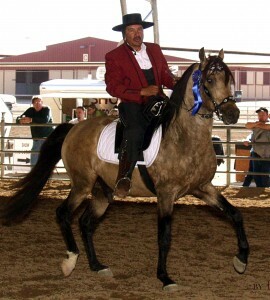 December 2005 marked the first Marchador-only classes at a local all-breed and gaited horse show. Held in Scottsdale Arizona with horses from Summerwind Marchadors and Great Lakes Marchadors participating. Three classes were held with at least four Marchadors in each class. None of the horses had shown before and all looked spectacular and well in hand. Because of the limited number of horses in each area, it is easier to join an all-breed show if you are interested in showing your Marchador. Show rules can be obtained from the USMMA office. See our events calendar for events happening in your area.